Who said vegetarians cannot enjoy a nice burger? We all have had a normal veggie burger and perhaps a bean burger at the famous Burger King. I love making bean burgers especially when fresh red kidney beans are in abundance. Have also used tinned red kidney beans. I use an avocado dip whenever I get avocados but you can use tomato ketchup. I just don’t like the taste of ketchup. In fact you can use any sauce of your choice or mayonnaise. I had to deep fry the burgers for a crunchy outer layer, but you can grill it or shallow fry if you wish. 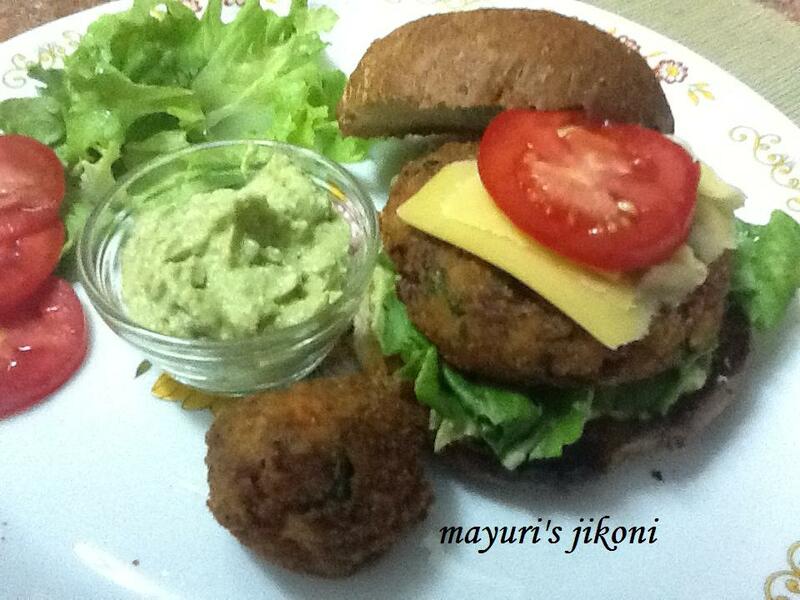 Onion rings are missing from my burgers as I don’t like the taste of raw onion unless its in salads. If you are using fresh beans, cook them with 2 cups of water and ½ tsp salt in a pressure cooker for 2 whistles. Drain out the excess water from the beans and put them into a mixing bowl. Mash them lightly with a masher. Add the rest of the ingredients for the burger. Mix well and divide the mixture into 6 parts. Make round patties from each part. If the mixture sticks to your hand, grease them with oil. For the coating, mix plain flour and water and make it into a paste. Put the breadcrumbs in a plate. Brush the pattie with the paste starting on top and the sides. Put the pasted side into the breadcrumbs. Brush the paste on the other side. Cover the top and sides with breadcrumbs and put it into a greased tray. Repeat with the other five patties. To prepare the avocado dip, mash the avocado flesh using a fork. Add the rest of the ingredients. Mix well and leave it in the fridge till required. If you are using cream cheese, taste the dip before adding salt. Heat oil in a wok or karai over medium flame. When the oil is hot, fry 2 patties at a time. Let the coating become golden brown. Remove and keep on a kitchen towel to remove excess oil. Or shallow fry. Don’t flip the pattie before the under side is cooked. Lightly toast the buns if you like. To serve, spread the dip on one half of the bun. Put the lettuce leaf, then the pattie. Top it with a slice of tomato, onion and cheese. Extra dip can be served on the side. Serve burgers with your favourite salad or salsa. Instead of patties make the mixture into small balls, dip in the paste, roll in breadcrumbs and fry. Serve this as a starter with tomato sauce or avocado dip. Instead of carrot you can used finely chopped bell pepper, any colour of your choice.